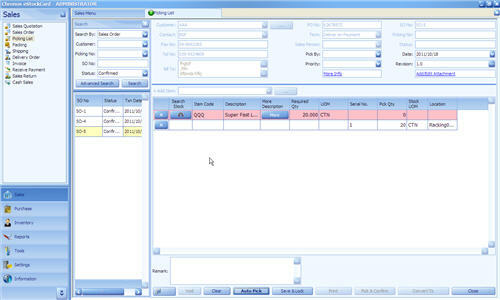 Any physical retrieval of inventories must be performed under this module in the Chronos eStockCard Inventory Software. Picking List can be prepared by either in Auto Conversion mode or Manual mode. Step 1 Launch Sales Order module. After the Picking List has been prepared, you are yet to perform the retrieval process. You can retrieve the inventories either “Auto Search” or “Manual Search”. There is an additional row (in white color) just right below every line and that is the location ID that suggested by the system. Step 2 Enter “Pick By” and “Priority”. These are optional fields for future reference. Step 6 Print barcode. User can print the barcode label after the items have been retrieved. However, you need to define barcode format and content at Tools > Label.